Area Rugs | Schmidt Custom Floors, Inc.
Rugs are far more than just a beautiful piece of decor. Whether they’re your inspiration for design or the finishing touch on a room, area rugs can be the perfect addition to any space. Rugs are a fun and versatile way to make your house a home. Learn more about our Rug Boutique here. Add a pop of color or keep your tones consistent with a fun or patterned area rug! Liven up a neutral space by introducing some color or tie all of your accents together to unify the room. 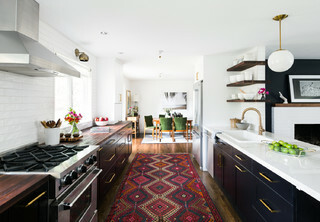 Rugs come in a huge variety of colors or even multi-colored, so it’s a great way to bring life and interest to a room. The best way to add depth to a room is texture. When a textured rug is contrasted with a smoother surface, it draws attention to the beauty of your hardwood or tiled floors. Varying the textures in a room creates balance and appeals to our senses. There are things to feel, things to look at, and it keeps our interest. Maybe the most obvious point, but area rugs amp up the cozy factor. It’s a great way to bring a room together in a subtle, yet intimate way. Adding a layer helps to soften and add warmth to your tile or hardwood floors. 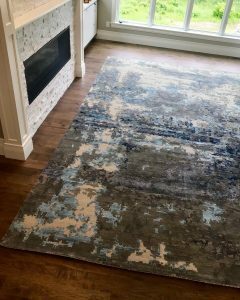 We love the long-lasting beauty of hardwood or tile floors but layering a rug over them can enhance that beauty and add a level of comfort to your floors. This advantage isn’t limited to hard surfaces, you can even layer over carpet! A feeling of comfort is inviting and makes relaxing in your space much easier. 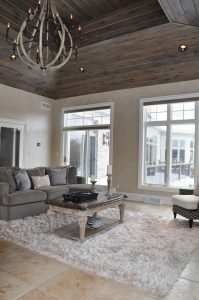 With open space concepts being all the rage, it’s hard to know how to keep your spaces defined and your guests relaxed. Rather than building walls, define an area in your home with a rug! If it feels like your furniture is floating, adding an area rug really helps to define a gathering space. Rugs can draw your eye to highlight your beautiful floors! Click here for a few more tips on rug placement and sizing. We know you love your wide open spaces, but the key to any great room is crafting intimacy. Keep the echo at bay with a rug! Adding a rug absorbs sounds instead of reflecting them back into the room. So while your rug may be a great conversation starter, it also helps keep the volume low. Win-win. The magic of a rug is the ability to quickly update a space. Don’t have enough time for a full remodel? Add a new rug over wood, carpet or tile for a dramatic update. Maybe you’re changing up decor to match the seasons… get a new area rug and quickly change the look and feel of a room! Any well-designed space needs to be tied together. Perhaps the most impressive feat of a rug is its ability to do just that. Complete your featured space with an area rug to unify all of your accents. The finishing touch is really what makes a house YOUR home. 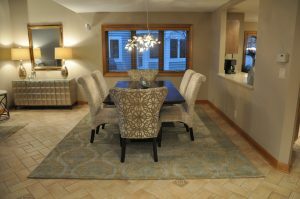 Come check out the Rug Boutique in our Waukesha showroom to view our selection of area rugs. We offer a variety of custom and ready-stock rugs, hand-knotted rugs, custom stair runners and more! And in honor of our 50th Anniversary, we’re offering a HUGE SALE starting October 18th through November 30th!